Apple has released iOS 6.0.2, a minor version release with a major fix aimed at iPhone 5 and iPad Mini users who have experienced problematic wi-fi connections with the devices. The changelog for the 6.0.2 update says the update includes improvements and bug fixes, but only lists “Fixes a bug that could impact Wi-Fi” in the list of adjustments. The iOS 6.0.2 update is available now and can be downloaded from iTunes by connecting the iOS device to a computer, updated with Over-the-Air from the device itself, or by directly grabbing firmware files that are hosted by Apple and updating manually with IPSW. Attempting the OTA update may provoke a temporary error as the release propagates throughout Apple’s content delivery servers, if you encounter such an error try again in another few minutes. The OTA update is by far the quickest method and the smallest download, taking less than a minute to install. These are direct download links of IPSW files hosted with Apple, right-click and choose “Save As”. We’ve discussed various connectivity and wi-fi issues pertaining to iPhone 5 on separate occasions, and previously offered a workaround that involved setting manual DNS entries which provided some relief for the sporadic wireless speed issue. Making troubleshooting initially difficult was the observation that wi-fi problems only manifested when a particular iOS device was connected to certain brands or models of wireless routers. 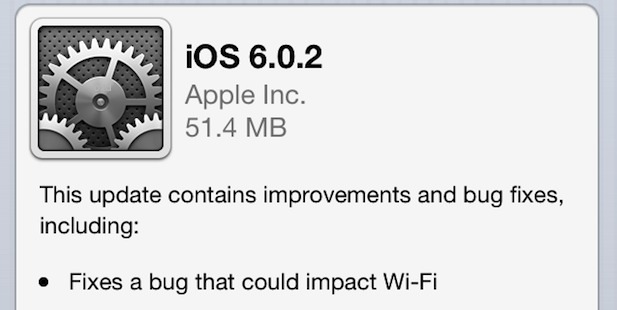 The iOS 6.0.2 update is expected to resolve this entirely, regardless of the router or device in use. As of now, the iOS 6.0.2 update is limited to iPhone 5 and iPad Mini. For other users, iOS 6.1 is currently in beta and expected to be released within the coming weeks. I installed the update but I don’t really notice anything. Probably didn’t have the problem to begin with I guess. Good-now perhaps Apple will fix the wifi problems with Mountain Lion. “WI-FI: looking for networks” has become the apple maggot of 2012! before the wifi working properly. Now it no longer works! What is the Apple developers. They walk on their heads. At this rate, SAMSUNG will eat you alive! The update wasn’t even for 4S, only 5 and iPad Mini. Same with my iPhone 5, there wasn’t any problem with wifi until I upgraded it & now It is very erratic and worse than simple 2G GSM (EDGE) speed, can I revert back?? These aren’t labelled properly on this article. As Apple has done, they should just be labelled with the model number. The ones marked CDMA are the UK models even though there is no use of CDMA in the UK at all. after updating, it seems not to have done anything to help my download speeds. I get 30-40 MBPS, same download on my first generation ipad i get 1.0 GBPS. WTF…. by the way I’m using AirPort Extreme 2.5/5 GHZ. I just don’t get it. Nope, still having the same problem. WiFi hangs and re-booting fixes it for a while.